will make landfall just some miles to the west of downtown Miami. Harvey, it beat the human forecasters at the National Hurricane Center. instead comes ashore over Miami then that's BIG trouble. will witness the greatest natural disaster in US history. get out of the area from the Keys all the way to West Palm Beach. secure location with food and independent long duration power supply. European model landfall West of Miami, says still unknown until Saturday. Stay safe down there! Best of luck. It's not all about Florida, and Miami ffs. Don't forget the rest of the islands already getting battered. skinters: Don't forget the rest of the islands already getting battered. U bet. My Fla warning v much informed by what's happening to 'em. The Turks and Caicos facing huge winds and a 20 foot storm surge, ffs! Said yesterday this would back down to a 4 BUT COME BACK. BELIEVE LOWEST PRESSURE YET TO COME. because it will be crossing currently very warm waters around the keys. This sucker is set to swallow South Florida. Yep, still bad. Really bad. #Irma is coming to South Florida. I'm leaving South Beach FL now headed for Marco Island. Posted: Sat Sep 09, 2017 5:12 pm Post subject: Irma la dure. A significant issue, now, is the storm surge from Irma on the SW coast of Florida. 5 to 9 ft. (above ground) of sea water with battering waves, will destroy pretty much any 1 or 2 story building. This will also extend up to Tampa-St-Pete and perhaps even as far north as the panhandle. Irma will leave a lasting impression on Florida. It is gonna hurt! The area is due for a major hurricane, and it is not prepared. If a big one scores a direct hit, the damage would likely surpass Katrina. 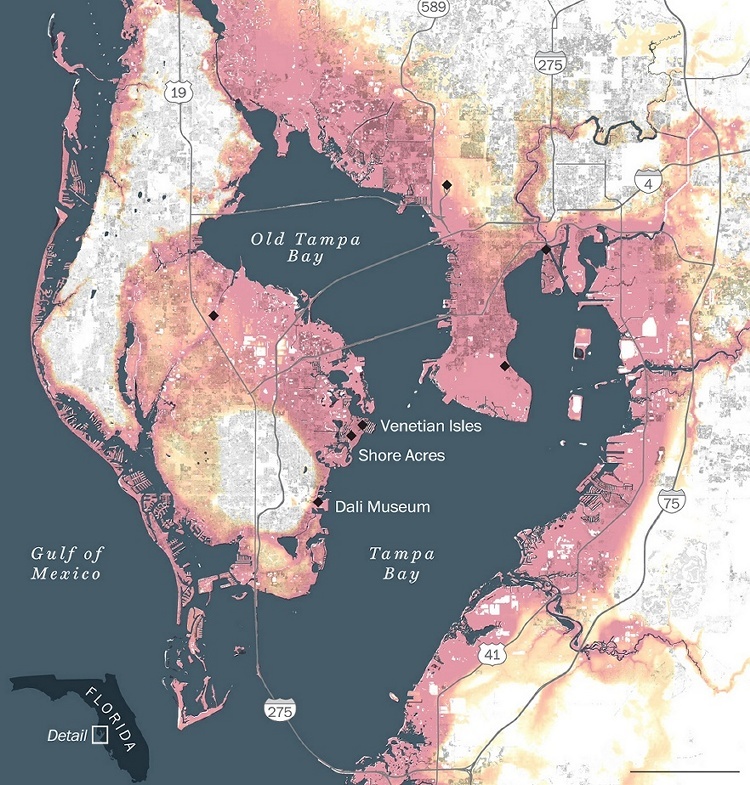 Yet the bay area — greater Tampa, St. Petersburg and Clearwater — has barely begun to assess the rate of sea-level rise and address its effects. of miles up from Key West. in the shelter of a gas station south east of Naples. The eye wall still passing his location at the time. This is what it looks like further north in Naples. Above Jeff Piotrowski with a brief Naples area update. testosterone-fueled storm chasers? Their Twitter feed went dark yesterday. Well, news surprisingly, they're both still alive! The most extreme damage was from Sugarloaf Key to Marathon. The massive surge caused significant damage there, along with the winds. Posted: Mon Sep 11, 2017 9:26 am Post subject: Jose can you see? And just what the US needs, a cat2+ hurricane making a loop-de-loop after skirting the lesser Antilles and taking aim on Florida/Carolinas. signs it will recurve away from U.S. East coast.